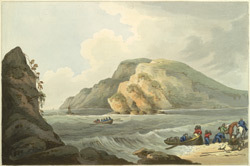 View of Smugglers landing at Freshwater Bay in the Isle of Wight. The smuggling trade has existed in England since the 13th century when a tax was imposed on exported wool, and Freshwater Bay, situated on the south easterly coast of the Isle of Wight was no exception. The trade in goods such as tobacco, alcohol and bullion reached its peak in the 18th century when high taxes on essential goods such as salt, forced people to supplement their incomes by smuggling. Smuggled goods known as ‘contraband’ often landed on secluded beaches and would then be hidden in caves along the shoreline.